Laughable, Entertaining, Absurd (at times, haha), Lighthearted, and KOOKY! I did it myself. I bought Microsoft Digital Image Suite a few years ago on sale for $30. It's like a Photoshop knock off but I love it! Most of my blog is rarely serious and very colorful so my blog and its button needed to be so. I am a lively, friendly person so I want my blog button to be inviting and happy! Creatively catchy phrases, colorful pictures or artsy and inspiring! I loooooooove blog buttons! Blogging to me isn't about how many followers I get or the number of comments (though I *LOVE* them), it's totally stress relief and it makes my day to hear that I made someone laugh! Truly and honestly, I just love to show the funny side of "mommying" and of life. Dolls And Daydreams Sarah is one busy artist and blogger. You may remember Sarah from the numerous times I've raved about her other blog and charity called Dolly Donations. This button for Sarah's other blog jumps off the screen with that cute little doll face front and center. 1) In one sentence, how would you sum up your blog? 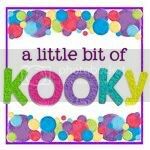 Dolls And Daydreams is a place where I share all my crafty delights, daydream giveaways, tips and tutorials! 2) What was the inspiration behind your button? How does it reflect your blog? 3) Did you craft it or inspire/commission someone else to craft it for you? I made it myself with Photoshop. 4) What kind of buttons stick out to you when you are hopping around in blogland? 5) Why did you start this blog? To share my work with other Mothers who love crafts, art, sewing, recycling and inspiring their children’s imaginations! 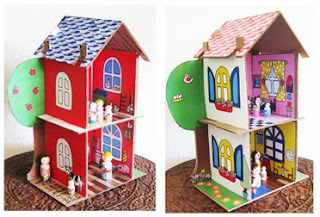 Current Giveaway is my Eco Friendly Doll House! A place for me to share all my creative passions, whether it's sewing, cooking, paper crafting, home decorating, holidays, entertaining - you name it! I am drawn to so many different design styles, it was really tough. I guess I just really wanted to stick out in people's minds and be unique among the many craft blogs out there. It has a very clean, modern and preppy look that I haven't seen a lot of. While the colors and "preppy" design are unique, I like to keep things sort of general too. I have so many creative passions, I didn't want to be tied down to one type of crafting. I'm on a huge sewing kick right now, but when I started my blog, I actually thought it was going to focus more on home decor and food! I had Shay at Dumplin Design Studio do my entire blog design, including the button. I like to joke that I can do just about anything with fabric, paper or glue, but I am NOT a graphic designer. I like buttons with a few bold colors, or a unique logo. I think it's really important for a blog to have a recognizable logo. I blog to keep myself accountable. Before I started blogging I had a project list that kept growing, but nothing ever got done because other things always were a higher priority... but with my blog, it keeps me motivated to keep crafting. My blog is also the first thing, in a VERY long time, that I've done just for the fun of it. No goals, no monetary motive... just sharing what makes me happy - making things! Take a few minutes and visit the blogs behind the buttons. Don't forget to say "Hi!" and give these bloggers a little comment love while you are there. Cute blog- found you from Sugar Bee. Can't wait to see your other projects! Fun! Thanks for featuring me! Love the button days!